So last evening I was reading the book The C Card and Me, by Ali Gilmore. It is an excellent resource and uplifting guide to getting through a cancer diagnosis and treatment, written by someone who should know: Ali’s cancer was stage 4 (as was Elliot’s at diagnosis). I had been feeling a bit anxious for no obvious reason other than the fact that last Monday at the hospital we were given the appointment for the end-of-treatment CT scan in about 6 weeks. This scan is unlikely to be bad, but still, since I’m a professional worrier it’s a perfect opportunity to dwell on the “what-ifs”. 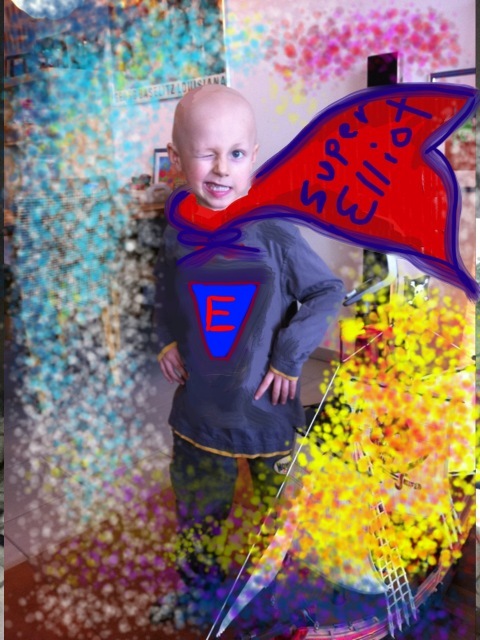 I know I should look at it as an opportunity to have a check up confirming what we already know; that Elliot’s cancer is in full remission, and then walking out of that hospital knowing we don’t have to go back for three whole months (hurray!). But I would not want to miss out on an opportunity for a good worry. So I curled up on the sofa with the book and an edge of anxiety that I couldn’t shake. Then I got to Chapter 3, Show No Fear. Many parts of this book are relevant for me in regards to how it can help me get Elliot through this difficult time, but this chapter spoke to me directly. Ali says it pretty clearly: “Cancer is no more than a bully.” I think I actually sat up on the couch while reading that sentence. It is just so true. Being afraid of a bully just gives him more power, more control over your life. But how do you overcome your fear without special powers? There really is no magic to it, and I’m still practicing this part… But basically, what I have learned is, you don’t. The fear stays. But you stand up to the bully anyway. Basically, you have to be the quivering little kid on the playground refusing to get off the swing just because Mr. Bigshot and all his sidekicks are taunting you with threats. Bravery is feeling afraid, but holding on tightly to your swing anyway. Maybe even swinging a little higher. It reminds me of a trip to London I made a few years ago. A good friend of mine from Ottawa was meeting me there for a few days before continuing on a work trip. I flew in from Geneva for a few days of fun, shopping and catching up. The date was July 8th, 2005. Most of my British friends might have caught their breaths a little there, but for those who didn’t make the connection, July 7th, 2005, the day before we arrived, is also known as 7/7… The day four terrorists bombed the Underground and bus system in downtown London, causing massive devastation, killing 52 people and injuring 700. Even if you are not British, I think that day was an emotional blow, in a world where we had all been starting to hope things might go back to normal. So we land in London. People are scared. We’re scared. Our hotel is near the airport, so the first evening is spent in the bar with the many other travelers all trying to drown their fear (there is a fun story about horse saddle shaped bar stools but that will have to be for another time). We all act shocked, outraged, but defiant. The next day the plan is to head downtown for some shopping, lunch, fun. Nervous? Yes, but I don’t say anything to Sylvie. She just looks totally fearless, unshaken. So how to get there? The Underground. “Well,” I say, “If everybody stops using the Underground, “they” win.” “That’s exactly right!” Sylvie says, and I’m a bit disappointed. Frankly, the last place I feel like going is on a train underground where terrorists have just struck. I was kind of hoping she would knock some sense into me and insist we take a taxi. We bravely head for the Underground station. We start down the escalator. Sylvie is staring at her feet. I am pretty sure we have lost our minds. I’m also sure that no Londoner in their right mind will be down here today. It’s a hot day, but that doesn’t explain the sweat I feel on my neck. After several agonizing minutes, the train finally pulls into our station, and we pour out of the train with most of the other passengers. There is a general, massive sigh of relief from the crowd. The volume slowly increases, people start chatting, laughing. We made it. We were all scared, everyone on that train, but we did it anyway. Why? Because if we don’t “they” win. And we head out to buy Sylvie some new shoes. So what’s the moral of the story? I guess it’s accepting your fear, but going forward anyway. Living life to the fullest, knowing full well it could all be taken away. Oh, and shoes. Definitely, shoes. Next postHave you been Swissified yet? I think courage belongs to those who don’t want to be labelled courageous . . . people who don’t want to rock the boat, face treatment, take that risk, and then do it anyways. That takes courage. What a great story you shared about the subway. I can literally see the crowd breath in relief as they step off the train, having not let ‘them’ win. Thanks Catherine, and you’re right about how you describe courage. I’m sure you’ve had people tell you how brave you are, and have you, like me, wished you could just forget about being brave and just go back to being “normal”? Love your blogs, you are an excellent writer like they said. And I enjoy reading them. Thanks! I also read your blog and am quite glad to see that Rosie is doing so much better now. This is really something that no parent should have to face, but I’m glad we connected anyway.